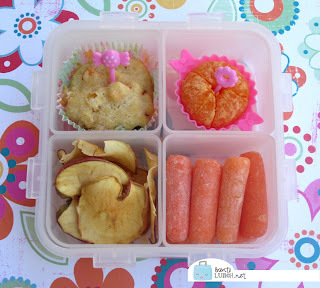 BentoLunch.net - What's for lunch at our house: Field Trip Bento, for Garden of the Gods! Field Trip Bento, for Garden of the Gods! Ben had his end of the year field trip to Garden of the Gods today. Since I got to be one of the parent chaperones, we were able to skip the disposable lunch and just use a recyclable one. It's always my preference and since I had my bag to carry things, we went with disposable. I originally had packed this lunch for Faith, but had to switch at the last minute, so switched out the pink decorations and the pink cup for something more Ben's speed. Ben had a chicken and veggie stuffed muffin, carrot sticks, a cutie orange and some homemade dried apple chips. He and I also brought along yogurt and cheese for snacks, along with our water bottles. His lunch was packed in a 4 square Lock&Lock, which I schlepped around for him.